One of my very good friends is having a birthday tomorrow. I really don't think she knows how often she enters my thoughts nor how often I pray that she continues to mend...but she's there...always...behind my eye...in thought. And she turns one year older in just a couple hours. And I, as well as so many others, are so glad to see this birthday of hers, because not very long ago, she spent this birthday in a hospital, recovering from one of the most horrific motorcycle accidents many have ever experienced. She is here for a reason. So glad. So glad I know her. Happy birthday friend. I have only silly little trifles to offer you. But I'm glad you are here today to celebrate. Lovely CAS design, Rebecca. Your friend with appreciate the creative thought! Beautiful card for your friend, Rebecca! I hope she continues to recover well. You are such a thoughtful friend to her. Take care! Very pretty! Love the green pop! What a touching story. I'm glad your friend is doing well. She's lucky to have such a wonderful friend like you to make her such a beautiful card. Thank you for sharing. What a beautiful card, and thank you for sharing your story. She is lucky to have a friend in you! 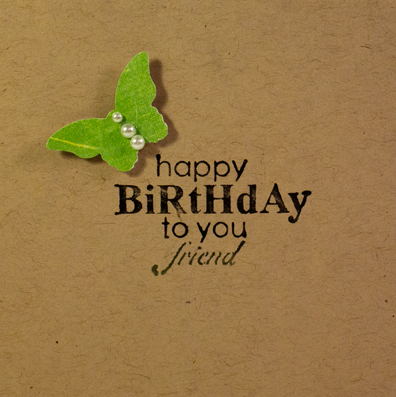 Great card and beautiful sentiments you have expressed about your friend. This card should brighten her day. How pretty it is in the lime green and Kraft. Lovely card. She is going to love it. Love simple and elegant design!! The green on kraft is so pretty! Your card style is right up my alley! Love your bright green with the craft card stock. This is just adorable! Fabulous card! Love the green and kraft. Love the doodling around the cut work! HB to your friend. Lovely card for a special friend. Love your card, I like using kraft paper too. The green works really well, will have to try that color combo. Thanks for sharing. Such a wonderful reason to celebrate ~ your friend is lucky to have you, too! Pretty card. Glad your friend survived to celebrate again! That sentiment is going to be used a lot here! This is absolutely beautiful. I love the colors. All Sparkles with Somewhere to Go!